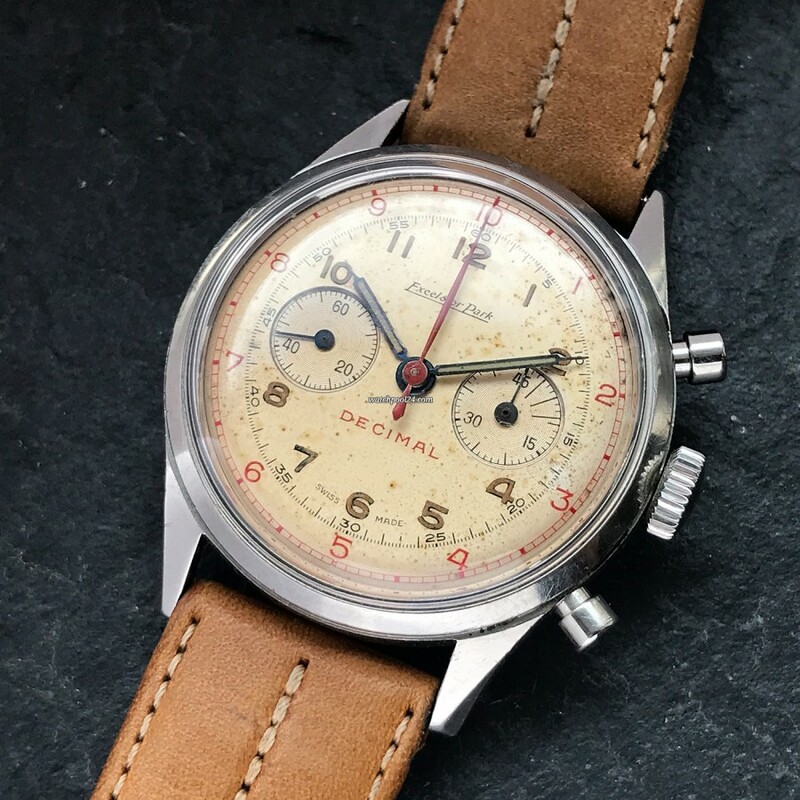 This unusual and rare chronograph Excelsior Park Decimal is from the 1940s and operated mainly in science. Due to the specialized use, only a small number of this watches were produced. Excelsior Park was founded in 1918 in Saint-Imier, Switzerland and produced stop watches and chronographs. Excelsior Park supplied its movements to Zenith, Gallet and other famous watch manufacturers. Here we offer you an Excelsior Park's chronograph, whose components are essentially manufactured under one roof - something vintage collectors seek for. The large stainless steel case measures 37 mm and has beveled lugs, which make the watch look very delicate and elegant. The overall condition of the case is simply sensational, especially considering the high age of over 70 years. The dial has natural spots of aging which have been developed continuous and evenly throughout the long life of the watch. The impressive patina reflects the age of this watch in a unique way. Aging is so natural and honest that if you look at it for some time, you can not imagine this watch has ever looked different. The material of the lume is radium, which could be detected by a test with the Geiger counter (see pictures). The dial has a red decimal scale that allows measuring 1/10s and 1/100s of a minute. This function was used, for example, in medical examinations or scientific experiments. The inner scale divides the minute as usual in 60 seconds. This watch is driven by the in-house EP4 (Excelsior Park 4) caliber. This movement was also the heart of many renowned watch manufacturers such as Zenith, Gallet, Girard-Perregaux or Sinn. The watch is in perfect working order. The chronograph pushers work properly. This old Excelsior Park chronograph combines prestigious past, reliable technology and an exceptional vintage look.